from 15 pcs. 0,94 EUR ea. A flat industrial magnet with a Ni-Cu-Ni base coat and a black epoxy resin cover coating. It can be glued together well with epoxy resin. 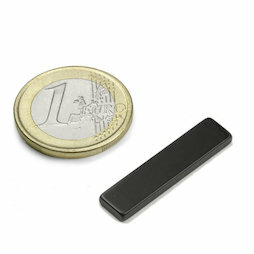 Thanks to the 38H magnetisation it can stand temperatures of up to 120°C without a loss of adhesive force.